Cats are bold animals that love to roam and explore their territory, although it can be dangerous to let your cat explore alone. Outdoor cats can get into toxic chemicals, be hit by cars, and attacked by stray dogs. Building a cat fence in your yard helps contain your cat in a controlled outdoor area, satisfying his urge to roam while keeping him safe from the dangers of the outside world. A cat fence can keep your feline friend safe in your yard. Measure your fence area and place a PVC fence post every 4 feet along the fence line. Hold the post in one hand, and gently pound it into the ground with a rubber hammer. Drive each pole at least 12 inches into the ground to prevent shifting as you string the fence. Unroll the chicken wire and attach the free end to the first fence post. Place a metal zip tie at the top, middle and bottom of the post, wrapping the tie around both the fence and the chicken wire. Pull the zip ties tight and trim the excess off with a pair of pliers. Connect the fence to the rest of the posts with zip ties, pulling the fence tight between posts to prevent sagging. Bend the top 12 inches of fence over at a 45-degree angle to prevent the cat from climbing over the fence. Walk along the fence and check for loose wires or gaps in the fence. Cats are curious animals and can be hurt by sharp or protruding wires, so trim or fold over any exposed edges to prevent injuries. Let the cat out in your yard and observe as it explores the new fence. 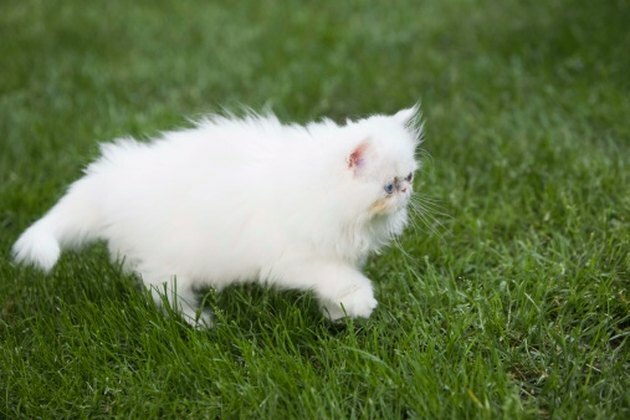 Leave the cat undisturbed as it explores the yard, making sure there are no holes or gaps that the cat can escape through.